Description: One of many new CSX ACs delivered in CSX's new image paint, the 594 with sister 599 helps pull a northbound empty coal drag. 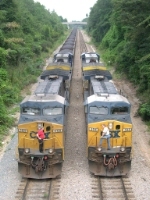 Description: Two CSX crews take a break just west of the wye outside Hamlet Yard. Description: Northbound Tropicana Juice train at Brooke Station on a dreary Virginia day. 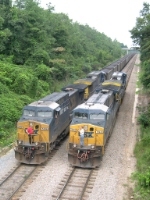 Description: Q410, An As Needed Train Running From Waycross, GA To Selkirk, NY. 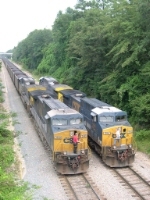 Description: Q118 follows Q112 south by about 15 minutes. Description: I'll spare you any number of obvious nicknames here....leading an empty OUC coal train northbound on the 4th of July. Description: CSX #594 holds with her mixed freight at Grasselli Junction, just south of 151st St. Description: #594 heads north past the Calumet Junction interlocking tower. Description: CSX Q676-28 sitts on the main with no crew waiting for the track to re-open after the derailment. This train was supposed to meet Q675-27, the train that derailed, here but now sits here for 22 hours. The derailment was 2.7 miles south of here.